England beat India by 42 runs via the Duckworth-Lewis method in the first one-day international at Scarborough. The rain-affected match saw England limit India to 193-8 from 47 overs, opener Smriti Mandhana hitting 74 before she was run out by Jenny Gunn. England reached 153-3 from 30.1 overs when the rain fell and curtailed play. Both Charlotte Edwards (57) and Heather Knight (53) made half-centuries as England returned to winning ways after last week's Test defeat at Wormsley. Two points will be awarded for a win, while points will be shared in case of a tie or a no-result. At the conclusion of seven rounds, the top four sides will gain automatic qualification to the ICC Women's World Cup in 2017. The bottom four sides will get a final chance of qualification through the ICC Women's World Cup qualifier in 2017. 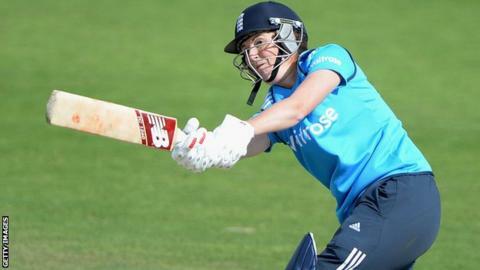 Knight also took 3-28 to earn the player of the match accolade, and she told the BBC: "It was nice to get out there, score some runs and contribute to a team win. "I'm really impressed with how the girls have turned it around today, we've obviously put in a really strong performance." Knight and fellow opener Edwards put on 110 for the first wicket to set the hosts on their way to victory. Sarah Taylor was 20 not out when the weather intervened. England and India will meet again in Scarborough on Saturday before the third and deciding one-day international at Lord's on Monday. The series marks the start of the ICC Women's Championship. The Championship will see all competing countries play each other over two and a half years, with the top four sides gaining automatic qualification to the 2017 World Cup in England. Edwards says the series is crucial because of the ICC Women's Championship. "It makes every one-day series that we play between now and 2017 significant," the 34-year-old said. "Whenever I step out to play for England I want to win, but now more than ever before, every result really does matter."